TriMet will have a clean energy bus fleet rolling on streets throughout the Portland metro area by or before 2040. That’s based on a plan approved by TriMet’s Board of Directors today, Wednesday, Sept. 26, 2018. We have been interested in pursuing an entire bus fleet powered by an alternative to diesel for years, but determining the road to take, and when to start the trip, has been challenging. 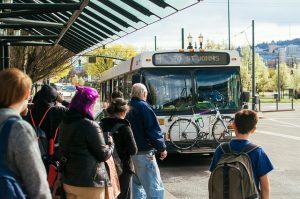 Buses powered by alternative sources historically have not been as reliable and robust as needed to serve TriMet’s extensive system of bus routes. Now, as the technology evolves and bus manufacturers commit to improvements in the coming decades, TriMet is committing to converting to a non-diesel bus fleet. State and local agencies have mapped out climate action plans to reduce greenhouse emissions. TriMet is a vital part of that. We already help reduce carbon emissions every time a person chooses to ride our transit service over driving their car. In fact, we estimate that TriMet eliminates an estimated 210,000 car trips every day. That offsets the diesel emissions our buses emit by roughly 21,000 metric tons annually. TriMet has been working to improve the emissions of our bus fleet for many years. Over the past decade, we successfully lowered emissions, improved gas mileage, achieved better fuel economy, and as an entire system reduced carbon emissions by roughly 57 percent compared to a single occupant vehicle. But, we want to do better – and that is why we continue to add new low-emission diesel buses as we explore alternative fuel options. Our buses normally last about 16 years. We wouldn’t retire the buses before the end of their useful life as that would not be fiscally responsible. Transit agencies haven’t had much experience with buses powered by alternative sources. The most widely used zero-emission technology is battery-electric buses. Still, only 38 transit agencies have or are purchasing electric buses, and most of their experience is with 10 or fewer buses. Also, the distance that electric buses currently are able to travel on a charge is far shorter than the vast majority of TriMet’s routes. We don’t know how our hills, cold winter temperatures and hot summer weather may affect the mileage of the buses too. Electric bus manufactures are improving battery technology and studies project extended travel ranges in the next few years. 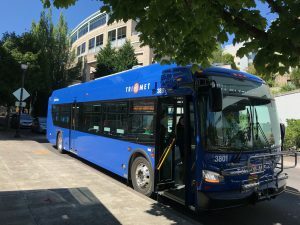 TriMet estimates that it would cost about $500 million more to replace our fleet with electric buses in year of expenditure dollars instead of diesel vehicles, plus meet the necessary growth. Electric buses cost about $1 million each, double the price of a diesel bus. There’s also the cost of the electrical charging equipment and installation of it. We need to spread the cost of conversion to non-diesel buses over the next 20 years to make it achievable. Funding from federal sources and money generated for transit by the Keep Oregon Moving Act will help partially pay for our transition away from diesel buses to clean energy vehicles. TriMet’s more than 80 bus lines serve a 533-square-mile area of Clackamas, Multnomah and Washington counties. Buses run early in the morning and late into the night, including two bus lines that run around the clock. In the coming years, our service will expand significantly, particularly in unserved and underserved areas. We’ll be adding new lines, making service more frequent, expanding hours of service and making improvements to speed up travel times. All of this is to meet the region’s population growth and help alleviate congestion. With the added service comes added buses. TriMet currently has about 658 buses and will need to increase that to about 930 by 2042. TriMet’s conversion to a non-diesel bus fleet will begin with buses powered by electricity, but since that technology hasn’t been fully developed, we’ll use the next four years as a test. We’ll purchase 60 electric buses and the charging infrastructure. We plan to dedicate $53 million from the payroll tax created by the Keep Oregon Moving Act to buy those vehicles and 20 others in year five. The zero emission buses will run on the streets in predominately low-income and minority communities. We’ll evaluate their performance, cost and reliability. Based on how those initial buses do, we’ll make a decision whether to ramp up, maintain or discontinue purchases of the electric buses to pursue some other technology altogether. We will continue to monitor and explore alternatives such as buses powered by hydrogen and renewable natural gas. We may choose to test those technologies as well. “Moving away from diesel buses and expanding service will be a double win for our region as increased transit use and cleaner running vehicles both reduce emissions, which is the ultimate goal for TriMet, our partners and the communities in which we live and play,” said Kelsey. Read TriMet’s plan for converting to a non-diesel bus fleet.